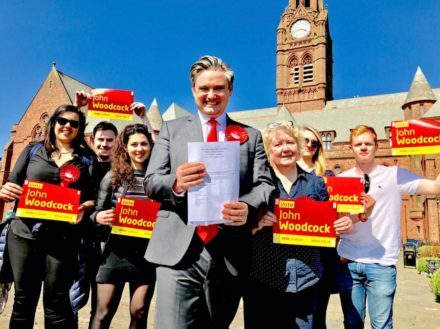 John Woodcock has quit the Labour party, claiming that the disciplinary investigation into him is being “manipulated for factional purposes”. He also alleges that antisemitism is being “tolerated” within the party, with his resignation coming a day after the party’s ruling national executive committee approved the controversial new code of conduct. In words that will doubtless be exploited by the Conservatives, he brands Labour leader Jeremy Corbyn a security “risk”. Woodcock says he will now sit as an independent MP on the Opposition benches, and has chosen not to trigger a by-election. Woodcock’s full letter is below. I am today resigning from the Labour party following your refusal to appoint an independent investigator to rule on my disciplinary case and in the light of clear evidence that the process has been manipulated for factional purposes. First and foremost let me make clear that I was elected to put the people of Barrow and Furness first, no matter how difficult or controversial. I have promised to fight for local jobs, promote a credible alternative government, protect the shipyard and ensure the safety of my constituents through strong defence and national security. I now believe more strongly than ever that you have made the Labour Party unfit to deliver those objectives and would pose a clear risk to UK national security as prime minister. The party for which I have campaigned since I was a boy is no longer the broad church it has always historically been. Anti-Semitism is being tolerated and Labour has been taken over at early every level by the hard left, far beyond the dominance they achieved at the height of the 1980s militancy. There is little chance of returning the Labour party to the inclusive, mainstream electoral force my constituents desperately need. In these circumstances, I can no longer justify engaging in a rigged process to be re-admitted to it. As you know, Labour’s new general secretary, who has previously said she wanted to ‘ditch Blairites’, overturned a previous ruling of a party disciplinary panel and suspended me after someone placed confidential details of my disciplinary case in two Sunday newspapers. This followed a newspaper report that the Labour leadership was looking for a reason to suspend me because of my opposition to your leadership. Emails that have since been released to me through data laws reveal that senior party figures have long been determined to prevent me re-standing as a Labour candidate because of my views on your leadership. It was noted in one such email that suspending me for a reason unrelated to those views would enable me to be barred from re-selection without risking legal challenge. It is not credible to expect a fair hearing in these circumstances. I strongly deny the charge made against me but am committed to the complaint being thoroughly and fairly investigated. I will now seek to refer myself to an independent process so the case can be properly heard. I hope you will listen to the growing calls from the Labour Too campaign and others to do the same for all cases. I am proud of what our community has achieved since I was given the opportunity to serve them in parliament, despite damaging government austerity. We have secured the historic Trident vote that guarantees two decades of work in Barrow shipyard; we have saved our maternity unit; and we are coming together to demand promised new investment to lift the crippling deprivation that blights too many local lives. There is still so much to do and I will continue to give all to the people of Barrow and Furness as an independent MP on the opposition benches. My loyalty to them always comes first so I will work with the government when it is trying to do the right thing, and will also work with the many good colleagues who are still trying to do their best in Labour.